Graham Fenton. Image by Peter Talbot. 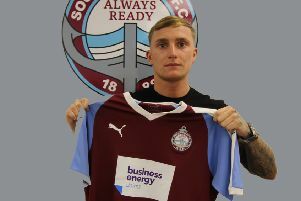 South Shields joint-manager Graham Fenton says he understands fan frustration – but has told unhappy supporters that ‘we’re not entitled to win every game’. The Mariners suffered their first defeat in 16 games on Tuesday night as they fell to a 2-1 defeat against Grantham Town at the South Kesteven Sports Stadium. They now trail Evo-Stik League leaders Farsley Celtic by two points, having played a game more than Celtic. 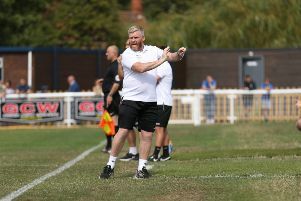 Fenton was appreciative of the travelling Shields fans who made the journey to Lincolnshire, despite – along with fellow boss Lee Picton – receiving some stick from a handful of supporters towards the end of the game. Fenton said: “I really appreciate them coming down. “I know there was a bit of frustration coming from the supporters today and I get that. “Yes we could have done better, we understand that and we understand the frustration but at the same time one defeat in 16 at any level of football is exceptional. “It’s possibly two or three people having a gripe and a winge but they’ve got to understand we’re not entitled to win every game of football. Shields fans showed their support on social media with many tweets of support for the team. With 13 games of the season remaining Fenton believed that battle for the title could go right down to the wire. Shields are third, and host second-placed Warrington on Saturday in a huge clash at Mariners Park. Shields are two points behind their rivals, having played the same number of games.